YELLOW 1 in. 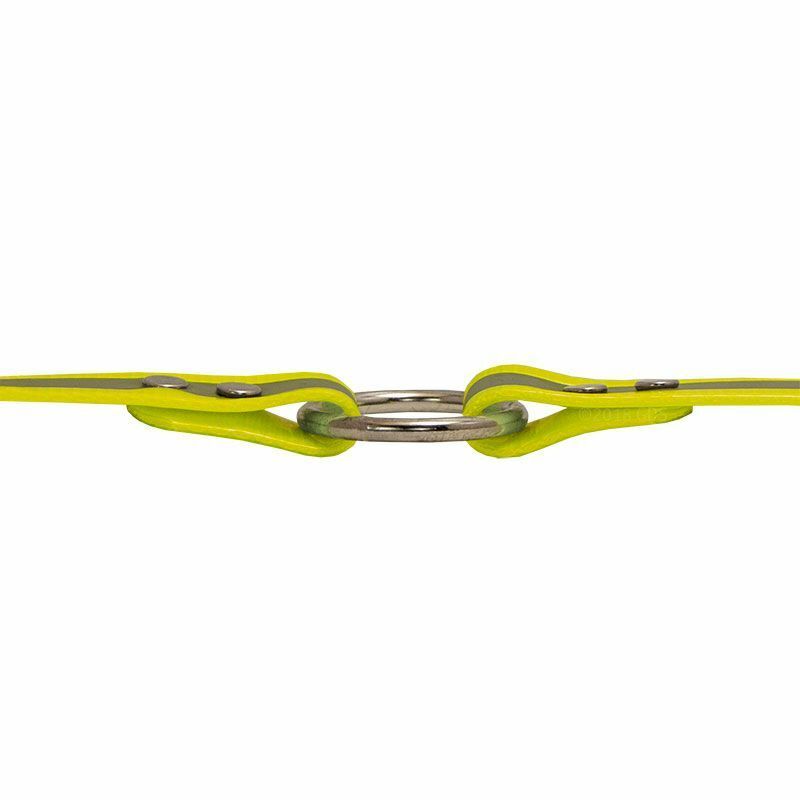 Reflective Center Ring Collar. $15.95. 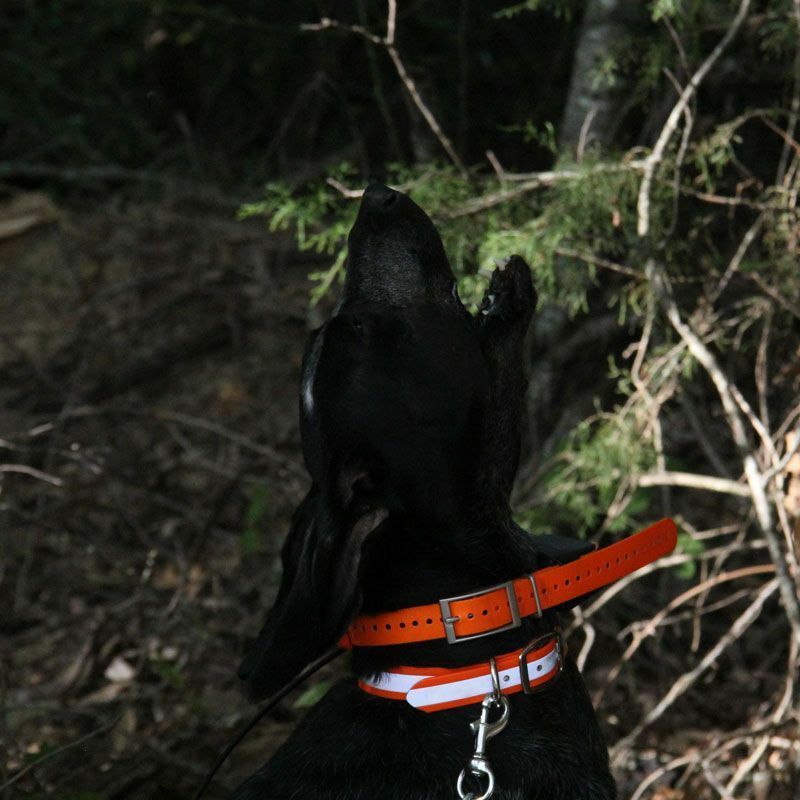 "This is the best collar I have ever purchased for one of my hunting dogs over many years." This is the best collar I have ever purchased for one of my hunting dogs over many years. 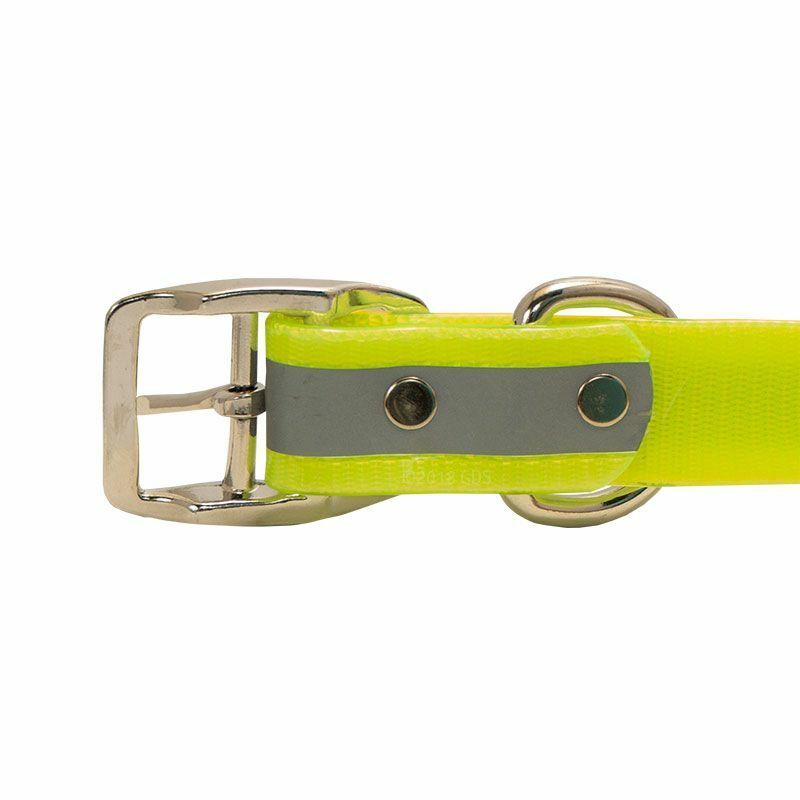 The reflective part of the collar is easily seen in low light conditions. The free brass name tag is a very nice. He loves to run off, and I was worried we wouldn't be able to see him if he did at night, now we can! I love the quality and durability of this collar and the washability. Only replaced last one because we changed phone numbers, and upgraded to reflective. I love this collar. Reflects well. 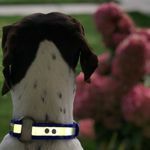 Now that it is dark early, it is great to have a nice reflective collar when walking at night. Tough and looks great. High visibility. Super fast delivery! Easy to use site. Happy with the collar. Super quality, plus big safety factor with reflector strip. Name plate is great. No dangling tags hanging off the collar. "Nice collar, and great ID tag." 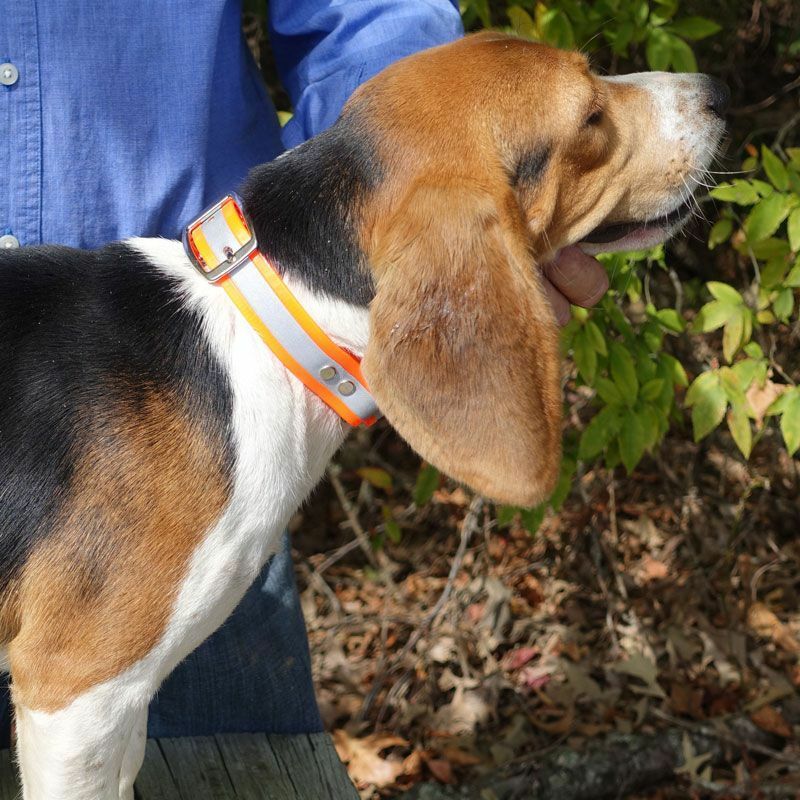 Nice collar, and great ID tag. "They are awesome, and I will continue to use them." My second order of these collars. They are awesome, and I will continue to use them. 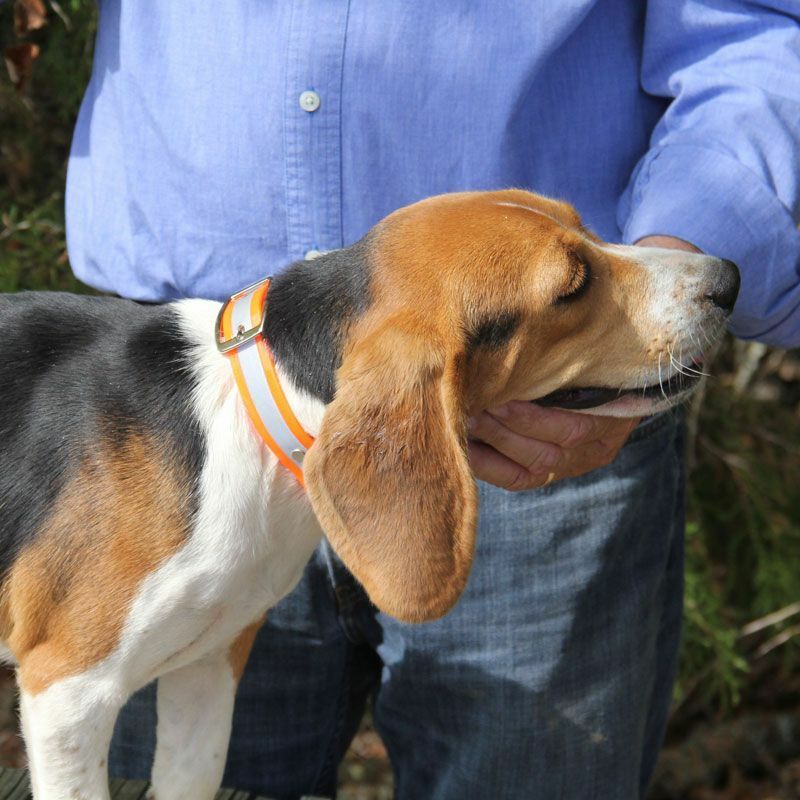 "Best collar on the market." This is the standard for all our service dogs from The Monkey Tail Ranch. Best collar on the market. Quality product. The added ring is perfect for attaching a leash. I bought two. Fits an inch or so more loose than the non-center-ring version. "Very high quality and low price." Very high quality and low price. 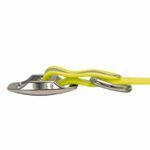 Durable, reflective and easy to attach a leash. "Holds up, doesn't collect slime, and reflects." Holds up, doesn't collect slime, and reflects. Wipe off to clean. What could be better? Ibizan Hound. Hunts. Family pet. Competes. Love it! Seems strong, easy to clean, and reflects light very well. Quality collar. Reflective strip is very bright. Great collar! Very durable, and the reflective strip makes it even better. For this price you can't go wrong. 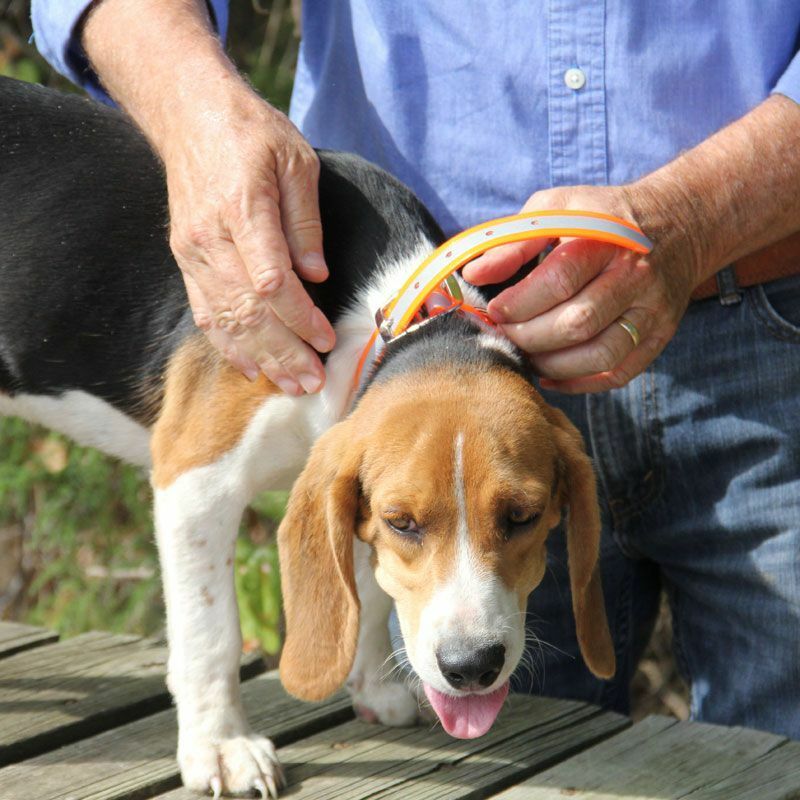 "This collar is flexible and durable." This collar is flexible and durable. I also like the reflexive band around the collar. "Collar was very well made"
Collar was very well made, and the nameplate was perfect! These collars are great. 1) the center ring makes it very easy to attach the leash instead of fumbling around for the tag ring; 2) for a dog that goes in the water a lot, this collar doesn't need the drying out a normal collar does; and 3) the name plate is awesome. "Arrived, custom nameplate, in under a week." Arrived, custom nameplate, in under a week. Very good quality. "He seems to be comfortable with this one." I went with the plastic collar because Jake is always in the water, and his previous collar kept him wet around the neck. He seems to be comfortable with this one. Bought the reflective type as he runs loose, not allowed on the roads, but should give some protection when walking. "I really like how just a small amount of light lets the collar glow in the dark." "Very visible both day and night." Very visible both day and night. (Not used when duck hunting). If you order extra ID plates be sure to write In the comment section to attach them to the collar. The order form doesn't ask if you want the plates mounted so you have to know to write that in the comment section. "It's a real high quality collar." It's a real high quality collar. "Great product; The collar fit is perfect." Great product; The collar fit is perfect. Anyone who orders this product will not be disappointed. The sizing chart worked great. I will order from this company in the future. collar is high quality. Thank you gun dog supply. Well made and attractive! Color was rich and looks more expensive than most collars. Identification information is deeply engraved, so will last a long time regardless of the abuse it will get from active lifestyle. This also allows to NOT have to have a bunch of tags on the collar that could fall off. Like the center ring to have option of attaching leash. Only issue is that my dog(s) have long hair so the reflective section doesn't show up as well as it would on a smooth coated breed. But every little bit helps! Nice product, and I would definitely recommend!! "Center ring is very convenient"
Center ring is very convenient, and the reflector stripe is great when walking our dog at night. "Would strongly recommend to a friend." Great products, fantastic customer service, and very reliable. Would strongly recommend to a friend. 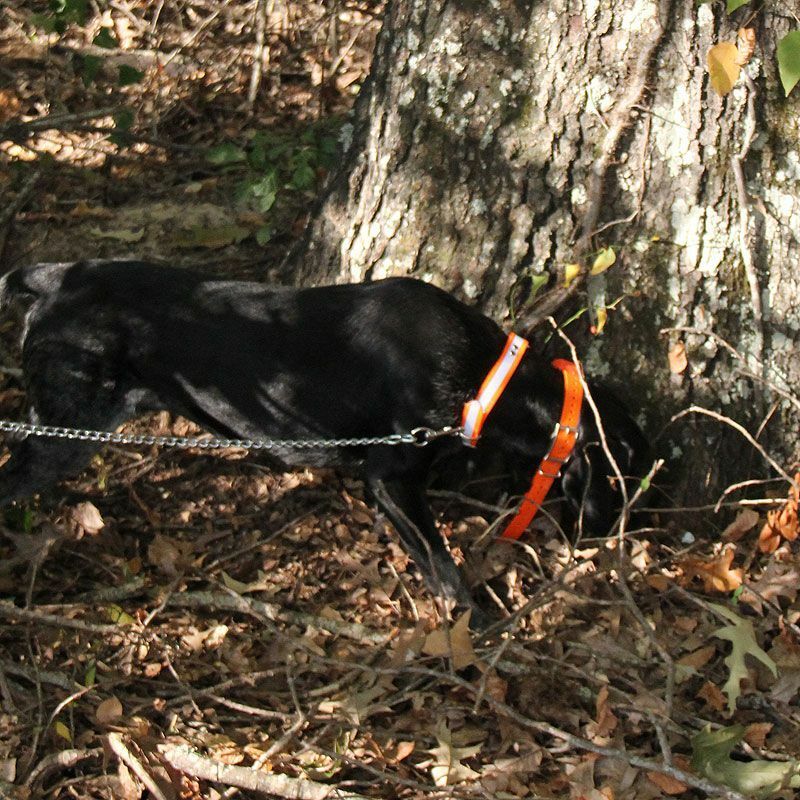 Collar shows up great in the field and is easy to clean up. Great product. Great quality, service and value. Love them. Show up great at night. "I really like the quality for the price." I really like the quality for the price. Great visibility and light weight. "Best materials free name tag. Can't beat it!!!" This is as good as a collar can be made. Best materials free name tag. Can't beat it!!! 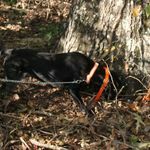 "Best collars at an amazing price." Best collars at an amazing price. Never get to stinking!!! 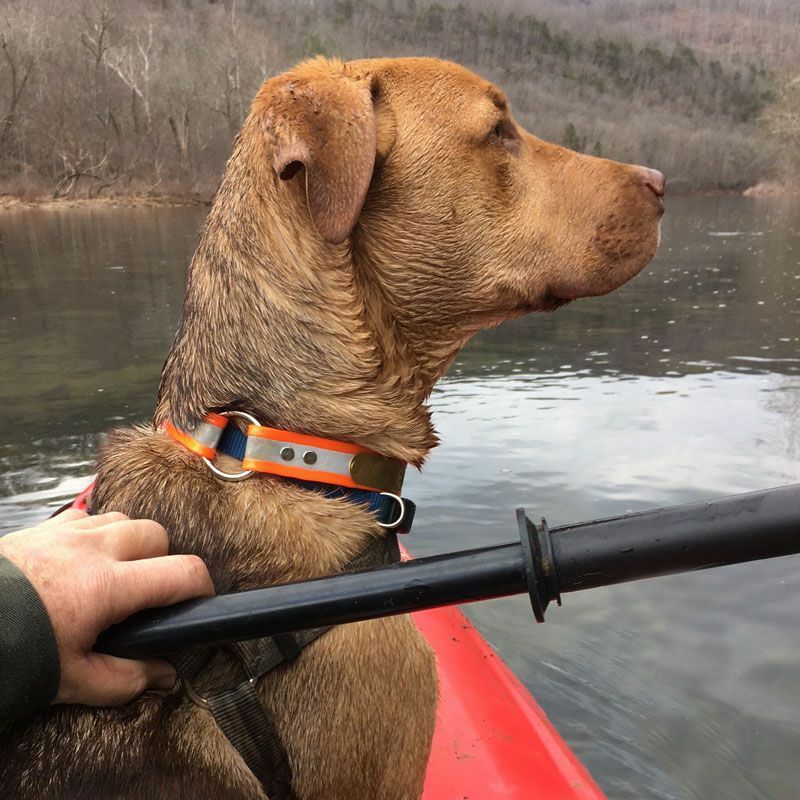 "I got the green reflective collar and it looks GREAT on my chocolate lab!!" I got the green reflective collar and it looks GREAT on my chocolate lab!! Also, I love the fact that it doesn't stink, and if it gets dirty I can just wipe it clean with a wet rag, and it's all good to go!! I have been through lots of collars because nothing's worse than a stinky do, and a big part of that is the collar. No more worries about that. I also like that the tag is right on the collar, so you don't have to hear the jingling whenever they are up and moving around. I would highly recommend this collar to anyone who has a dog!! Very affordable and great quality for the price. "Very durable material and is truly reflective." Easy to put on and take off. Very durable material and is truly reflective. I can easily find my dog on a pitch black night. Good quality! Easy to take on and off. Excellent price! Wonderful. Can see at night. "I found these collars several years ago, and they are all my dogs wear!" I found these collars several years ago, and they are all my dogs wear! Not only are they easy to clean, they are reflective, and the complimentary nameplate with their contact information gives me extra security. 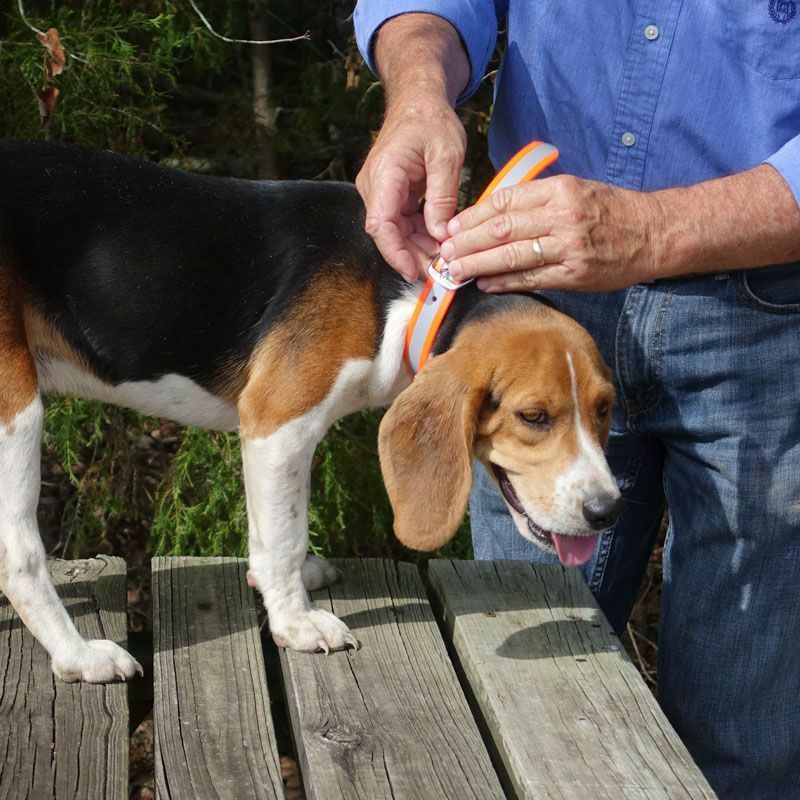 I find lost or abandoned dogs several times a year, and I sure wish all dogs had this collar - faster than microchip. Love the collar. Keep the prices low, and this business will certainly grow! Great quality! Good collar! I like the two strong rings to attach a leash or check cord. Collar has good visibility. Like the brass name plate. Great collar. Fits great and is tough. "Great collar and great service." I live on a highway. Love this collar's extra night time reflective safety feature. I always get the brass name plate, and with other vendors that usually adds a lot of extra days. Not at Gun Dog. They have made and shipped mine on the same day. That is great service. Great collar and great service. "The reflective collars are great." 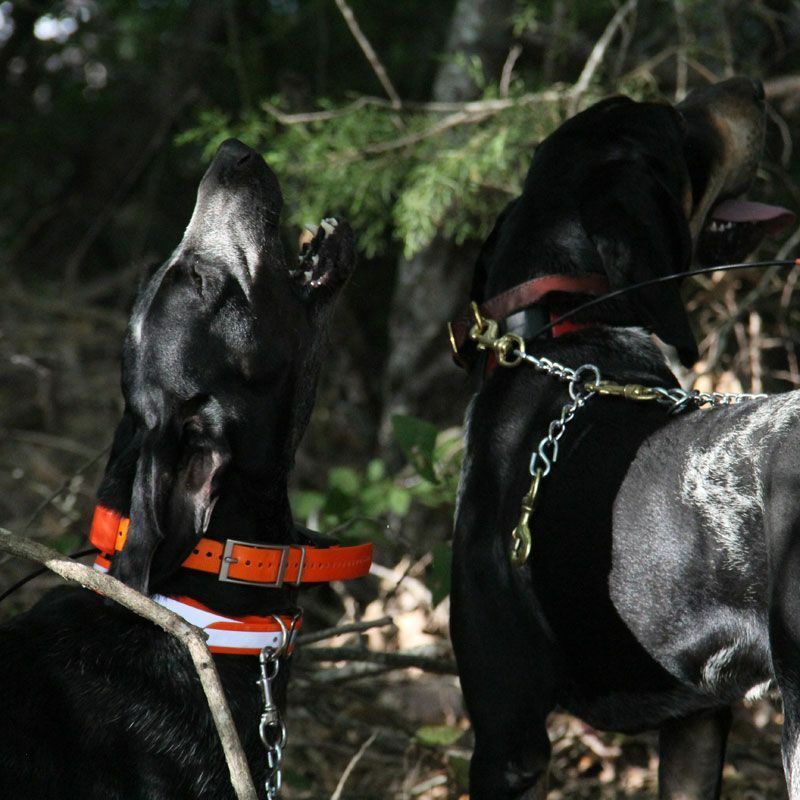 The reflective collars are great. With the tags secure to the collar, there is nothing to get lost. Love them. Great product. Exactly what I was expecting. Name plate lettering is a little small, but I guess it has to be to get the amount of information I wanted on it. Overall, excellent! I recommend these collars to everyone. So far, so good. 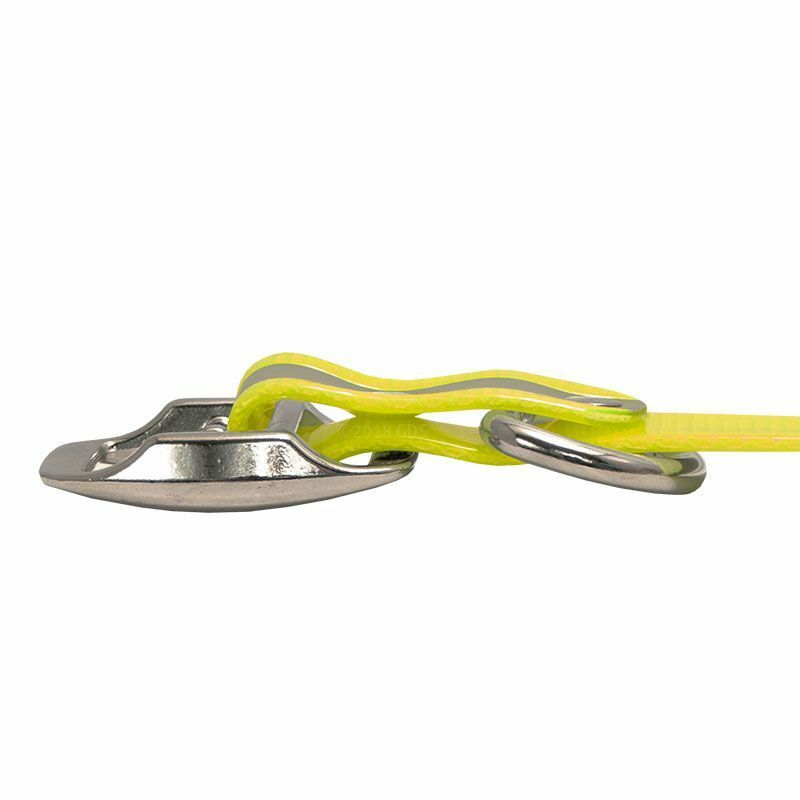 We had 2 Kong dog collars that broke within weeks due to the dog running to the end of 30 foot tie down and would break the nylon quick disconnect connector. Pippen is 50 lbs of muscle bound puppy and broke 2 different tie down cables of 60 and 100 pound cables, and we now have a 125 lb with shock absorbing end with the new collar. Seems to be working well. Thanks. Great collar! Have purchased many from Gun Dog Supply!! Highly recommend!!! "Well made, reflects well, and easy to clean." The collar was just as advertised. Well made, reflects well, and easy to clean. Thanks. "Would highly recommend this collar." One of the best collars I have purchased so far. The reflective ring and hunter orange color works well in the field. The material does not hold a smell when subjected to water, and has held up well in both hot and cold weather conditions. Would highly recommend this collar. "Great during training and low light situations." Great during training and low light situations. 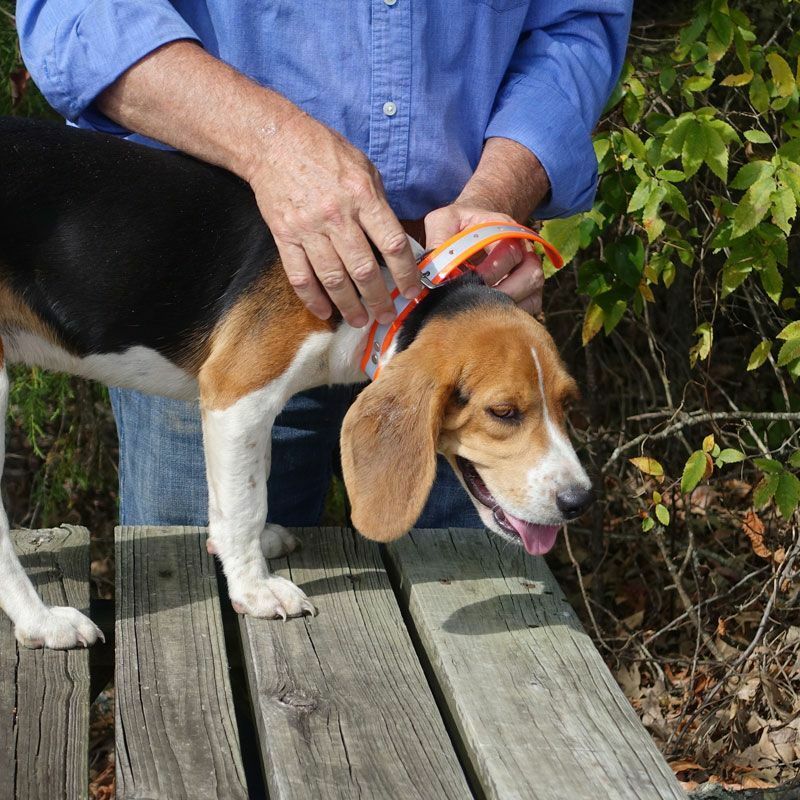 Safety, if dog get out near traffic, or when looking for her in the field. 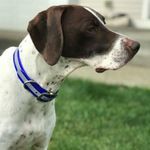 "The collars are durable and priced better than anything in the pet stores, making them the ultimate value." In our opinion and experience, there isn't a better collar. We can spot our dogs at the dog park and in near complete darkness. The collars are durable and priced better than anything in the pet stores, making them the ultimate value. They wash up easily as well. Truly a great collar that pays for itself. Great product! Ultra reflective and also quiet, so Rennie can do his job without alerting the local predators. "Just bought another for my second lab. The first one is still good as new!" Just bought another for my second lab. The first one is still good as new! 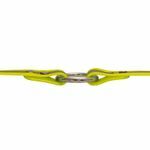 This is our 3d of these collars. They are very well made and the price can't be beat. Dog is 9 this year, so you get about 3 yrs out of it before the reflective part wears off from use/exposure. Great product. I already had 3 and ordered a new one for the puppy. 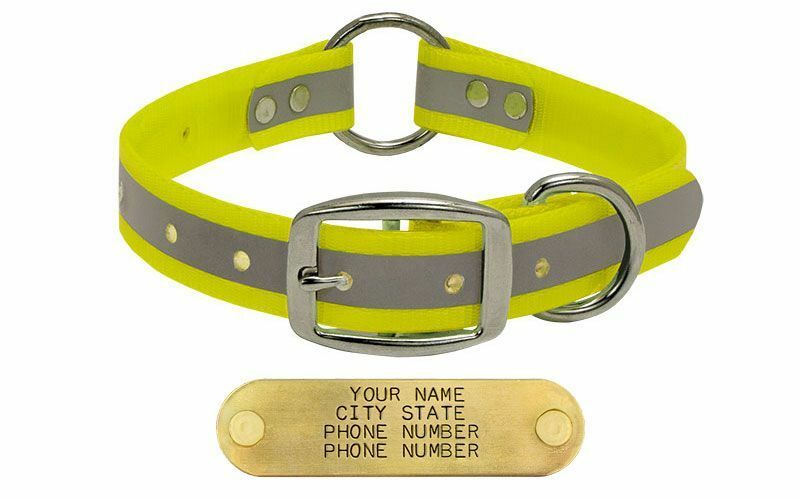 These are very durable collars, and the name plate comes in handy when the dogs like to roam. Fast shipping and great people. 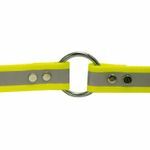 "We have purchased 3 of these collars and have been very happy with them!!" Australian shepherd and lab. Family pet. 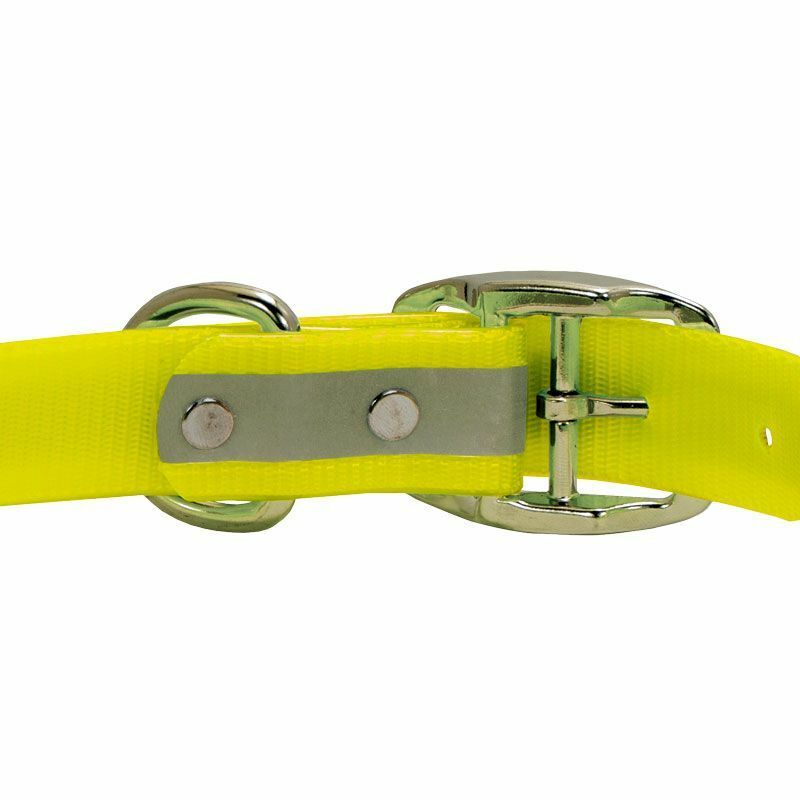 We have purchased 3 of these collars and have been very happy with them!! 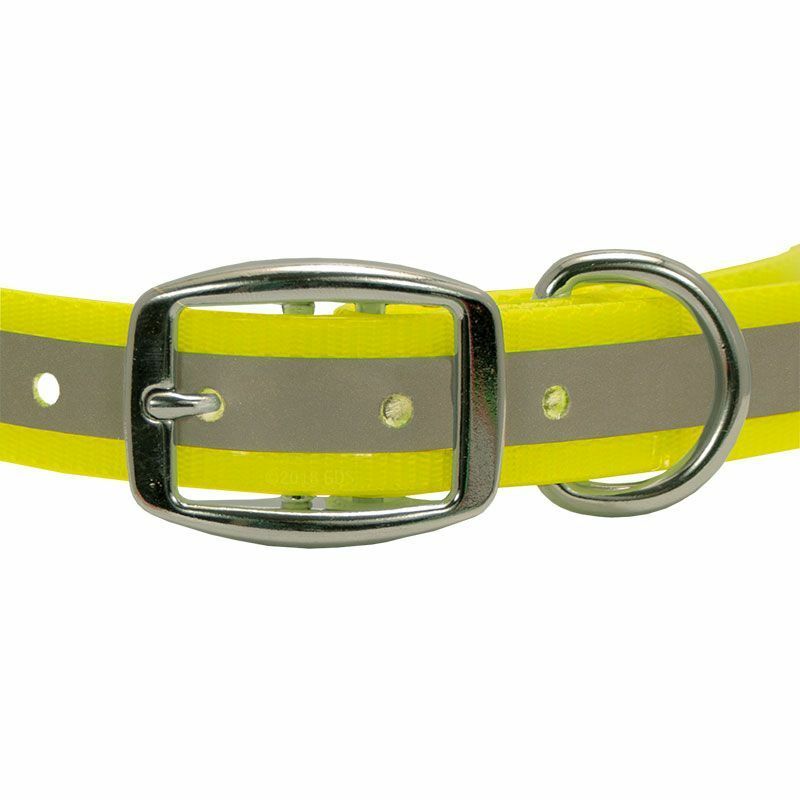 Would have liked to have the Tufflex style collar with a reflective stripe option. "Durable, easy to clean, and they don't absorb odors." Have used these collars for years. Durable, easy to clean, and they don't absorb odors. And the reflective area is a great safety feature. I highly recommend this product. "Love the product and love this business." Boykin and brittany. Hunts. Family pet. Love the product and love this business. They always ship fast, have great prices and get my orders right! "Seems to be durable and easy to keep clean." Seems to be durable and easy to keep clean. Highly reflective. Fit well. Great for hunting. Great value. This is our third one (for each place we visit). Love the brass grommet tag. Our dog is black, and our vet is proud of us for finding this collar. Reflective strip is excellent for visibility at night. Prompt delivery. "Good products, good prices, and fast service." Good products, good prices, and fast service. The end of the collar was a little scratched and rough feeling. But besides that it's great! Good. I like the 1 inch collars, but have had issues with the 3/4 inch. I have had 3 collars that have pulled apart at the rivets. They are only 6 months old. No issues with the 1 inch. "I especially like the reflective band. Helps ID the dog at night." Wished I would have been able to know right size for my dog. Measured, but collar to big. Seems to run a little larger than most collars, but is good quality. "The reflective stripe is terrific for exercising the dog in the early evening hours." If this collar had the plastic keeper to keep the extra collar length from flapping I would give it a 5 star. The reflective stripe is terrific for exercising the dog in the early evening hours. "The collar looks great and works great." The collar looks great and works great. There is some minor splitting on the end of the color. Nice collar, but my dog has a large neck and chest with a narrow head. The collar is very smooth, and as Annie's fur is very short, she slips out of it very easily. I don't want to get it any tighter, so probably won't use it. The name plate is secured on the hole side of the collar rather than the blank side. I could not add a hole without removing the name plate and moving it to the non hole side. Was not expecting neon yellow. Wanted it to be more school bus yellow. Also needs one more hole punched in collar to fit my dog. The 18 inch is too small and the 20 inch too big. 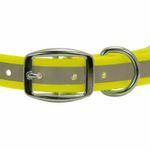 Reflective center ring collar has a reflective strip that runs the length of the collar. 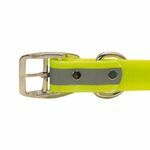 It reflects the available light to increase visibility and safety for your dog in low light conditions. Made from TransFlex, which is virtually indestructible and maintenance free. TransFlex cleans up with a damp sponge, resists mildew and bacteria and therefore is odor-resistant. This vinyl-coated webbing also keeps its flexibility in cold weather. Rivets are in line, not side by side, for increased durability. Rust-resistant nickel-plated hardware consists of square buckle, center ring and Dee. Welded hardware. 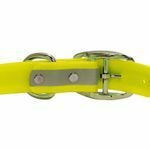 A center ring has a rollover design for your dog's safety. K-9 Komfort products are proudly made in the USA. These are NECK SIZE COLLARS which means the dog's measured neck size IS the collar size. The neck size (NS) represents the measurement from the center of the buckle to the fourth adjustment hole. You can adjust 1-inch longer or 3-inches shorter. 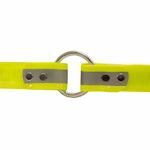 Keep in mind that using the shorter adjustment holes will leave more collar strap extending past the buckle.